NUHW members are actively working to save Seton Medical Center and Seton Coastside from potential closure. 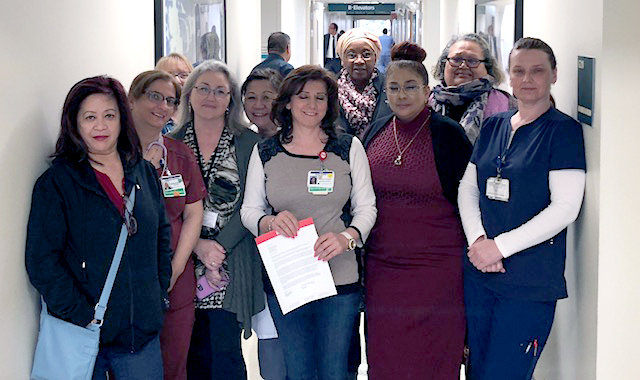 Amiame Fanaika, a Seton shop steward, attended meetings of a coalition formed to find a buyer for the hospital as well as forums with the hospital’s chief executive. The” Save Seton” working group, which includes political, labor and health care leaders in San Francisco and San Mateo County, formed following a community forum during which workers pressed community leaders to save the facilities. During that meeting, Fanaika called out elected leaders attending the forum for their lack of specific proposals. The following day San Mateo County Supervisor David Canepa announced formation of the working group. Shortly thereafter the San Francisco Health Plan announced it would partner with Seton Medical Center and Seton Coastside, providing financial support and access for San Francisco residents. Seton Medical Center, a 357-bed hospital in Daly City, has the nearest emergency medical department for more than 150,000 residents of Northern San Mateo County and southern San Francisco. The hospital and Seton Coastside, an urgent care facility in Moss Beach, are two of six medical facilities owned by Verity Health System, which filed for bankruptcy in August. Santa Clara County is seeking to purchase Verity hospitals in San Jose and Gilroy, but San Mateo County officials have said they don’t have the resources to pursue a similar acquisition.